Okay so let us get this out of the way quickly, you don’t watch an Elvis Presley movie for its in-depth, multi-dimensional story line. If you even attempt to rate or review an Elvis movie on its story, then you have already missed the point of the King’s musical escapade. Long before Michael Jackson raised the bar with his highly produced mini-movies with his music videos (Thriller, Smooth Criminal etc), Elvis was doing it 30 years earlier. An Elvis movie is essentially just a string of music videos weaved together with a very thin narrative that simply gets us from one musical number to the next. Viva Las Vegas is no different, except this time, set in the world of race car driving in the Nevada desert. 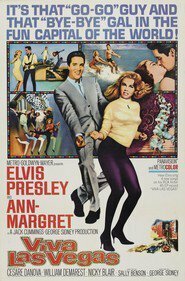 Ann-Margret is his leading lady who simply steals the show from our Elvis without him putting up any resistance. He knows he is out ranked and defers screen time to her. Not only can she sing, but she can dance with a sexiness that I am sure skirted the censors of the mid sixties. The lady oozes sexual sensuality without showing too much or resorting to cheap tricks. Pure class. This was an unusual setup for Elvis movies – the leading lady was always the very feminine, disarmed and vulnerable that he would win over and they would fall in love with him. Ann-Margret broke that mold. For the number, If you think i don’t need you, keep an eye on Ann-Margret’s eyes when Elvis comes into the room with a guitar trying to woo her. Natural response with a knowing that Elvis was really trying to woo his leading lady and she wasn’t going to make it easy for him. You can see why Elvis fell for Ann-Margret so hard, as this was the movie their affair started that continued for a year or so, then they became life long friends. It is rumored Elvis would often phone Ann-Margret seeking her advice on all manners of things right up to his death. She referred to Elvis as her soul mate. Viva Las Vegas delivers on some wonderful classic set pieces, including Yellow Rose of Texas, Lady Loves Him, C’mon Everybody and of course Viva Las Vegas. All in all there is 12 musical numbers dotted throughout. A highly enjoyable Elvis movie and one that can be thrown on in the background for the series of musical tracks.